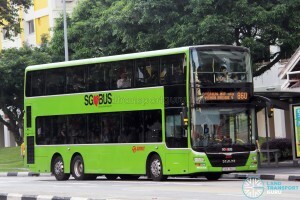 The Bus Contracting Model (BCM), is a contracting model for public bus services in Singapore. The scheme was first announced in 2014, then called the Government Contracting Model (GCM). The main benefits touted by the BCM are its responsiveness to changes in ridership and commuter needs, as well as the injection of greater competition within the industry, thereby raising service levels for commuters over time. The following parts will explain how the BCM works. Alternatively, they are summarised in this video by the Land Transport Authority (LTA). 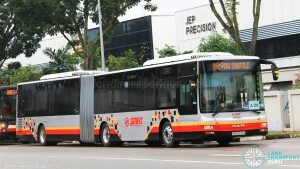 With the Bus Service Operating Licenses (BSOL) for SMRT Buses and SBS Transit expiring on 31 August 2016, the Land Transport Authority took the opportunity to revamp the bus industry into a competitive tendering process. Elements of the scheme were adapted from contractual schemes used in other regions, such as Transperth (in Perth) and London Buses (in London). 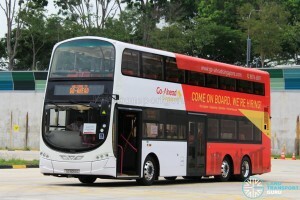 In addition, the LTA has pursued a unified livery across all public buses in Singapore. Lush Green was chosen as the base colour, having been the preference of the majority of commuters through a public poll. Bus operators earn revenue from fare collection, advertising, etc. Buses, bus depots, bus interchanges, fleet management systems, etc. Bus operators will bid for bus route packages through a competitive tendering process, and be paid a fixed fee to operate the bus services. Running costs are considered separately and will be paid fully by the Government. What are the new roles of bus operators? Provide customer management services, such as lost and found service, and a hotline for commuter feedback and enquiries. Lowering entry barriers, introducing more market competition leading to the provision of better bus services in a cost-competitive manner that will benefit commuters. So how will commuters benefit? The contract model is currently in use in London and various Australian cities; their transport systems which LTA is modelling from. The Government is now able to directly subsidize bus operations to maintain better service levels, even if such levels of service are unprofitable. 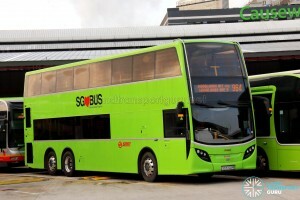 In September 2016, bus services in Singapore were announced by the Land Transport Authority to be bundled into fourteen bus packages with about 300-500 buses each. The number of bus packages was previously announced to be twelve back in 2014 at the start of the Bus Contracting Model scheme. The contracts will last for five years, and can be extended by another two years with good performance. With the negotiations with the incumbent operators (SBS Transit and SMRT) complete, the Bus Service Operating License (BSOL) for the remainder 11 packages not tendered out as of 2016 has been extended for 2-10 years, starting from 01 Sep 2016. After these negotiated contracts expire, the bus services in the 11 packages will be gradually tendered out. This gradual, phased transition will allow LTA to refine and improve the management of contracts, as well as the tendering and handover process, and minimise the risk of service disruption. Each new tender or change in contract for bus services can result in the movement of bus employees from one employer to another. To safeguard the welfare of the affected employees and ensure their smooth transition to the incoming operator, the Public Transport Tripartite Committee (PTTC) released the Guidelines on Good Employment Practices in the Public Bus Industry (the “Guidelines”) on 16 September 2014, detailing the obligations and responsibilities of both incoming and outgoing bus operators. 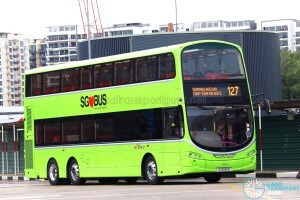 These include the timeline for the offer of employment, recognition of the length of service, employment terms to be safeguarded, treatment of affected bus industry employees including those who choose to stay with the outgoing operator, as well as training for those who choose to join the incoming operator. Affected employees can choose to join the new operator or be redeployed by their current employer, where feasible. These employee aspects of the Guidelines have been incorporated into LTA’s tender documents, and will also be included in LTA’s subsequent contract with the Operator. With the transition to a bus contracting model, the Government intends to also raise bus service levels to beyond those of the expanded BSEP. All Feeder Services operating at intervals of 6 to 8 minutes. As a result, an estimated 45% of bus services will have shorter intervals during peak periods when compared to the expanded BSEP service levels. All tender submissions will be evaluated by LTA through a 2-envelope process for quality and price with greater weightage given to the quality proposal submitted by the tenderers. 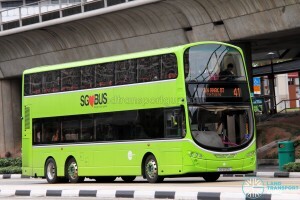 This was evident when UK bus operator Tower Transit won the Bulim Bus Package despite offering the third lowest bid of $125.6 Million per year, in contrast to the lowest $93.7 Million per year bid from SMRT. LTA awards route packages (tenders) based on “Gross Cost Model”. The Operator which the tender would be awarded will be required to set up a local company to operate the Route Packages, with senior management overseeing its operations to be based in Singapore for better oversight and accountability. There will also be provisions for additional bus capacity in the contract which will enable the Government to make expeditious adjustments to the Route Packages when necessary, in response to changes in ridership and commuter needs. During the contract period (5-7 years), the service fee which is the Operator’s bid price for the package, will be adjusted to better reflect the operating climate by taking into consideration inflation, changes in wage levels, and fuel costs. Separately, the Operator will be able to tap the Bus Driver Training Grant for new bus drivers trained and deployed on the bus services from the date of award of contract to December 2016. The Operator will be paid the service fee on a monthly basis with deductions for non-operated mileage that is within its control, such as driver absenteeism. Among other requirements, bus operators bidding for the package must have a proven track record of operating a fleet of at least 250 buses. With LTA being the central bus planner, it will continue to introduce new routes and amend current routes to suit the needs of commuters. While an overhaul of bus services is unlikely, several routes may be amended/split for better reliability. As more housing estates are being built, the number of basic services will only increase to suit new travel patterns. An exception is cross-border services, where regular service standard indicators do not apply, owing to complex traffic conditions across the Causeway. Instead, they are measured based on the mileage fulfilled. It remains to be seen how these services will be tendered out to operators. Routeings and operation hours of Fast-Forward services will be unchanged and tendered out along with the parent service, such as Service 97e tendered as part of the first Bulim Bus Package. However, the “Fast-Forward” branding from the SBS Transit days would be dropped, and they continue to charge Express fares. Chinatown Direct services are also retained and tendered out due to their popularity with residents. Express, NightRider and Nite Owl services form part of the routes in various bus packages as well. As PTOs are gradually handing over Premium services to private bus operators, premium bus services will not be operated by public bus operators with BCM assets. 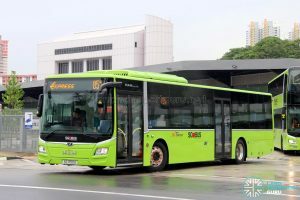 They will be gradually be fully transferred to private operators, or continue to be operated by their non-franchised divisions (such as SMRT’s BusPlus charter division). LTA has initiated the BCM initially using buses destined for SBS Transit but registered under the Bus Service Enhancement Programme (BSEP). 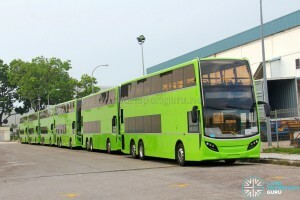 These buses, destined for service with SBS Transit fleet but owned by the Government, were rerouted to operators of the first few BCM packages such as Tower Transit, the initial operator of the Bulim Bus Package. To further expand the BCM bus pool, the Land Transport Authority said on 29 December 2015 that it would take over SBS Transit’s bus purchasing contracts worth S$164 million for 346 new bus purchases, scheduled for delivery in 2016 and 2017. 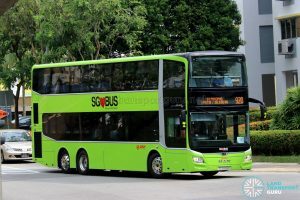 It will also directly buy 50 buses, worth about S$23 million, which were delivered to SBST between June and December this year. 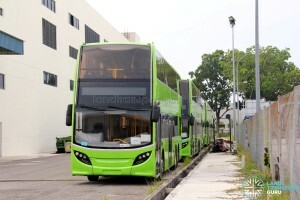 Among the 346 buses to be bought under the contracts, 100 are single-deck buses, while 246 are double-deck buses. 210 of these buses are scheduled for delivery in 2016, and the rest in 2017. 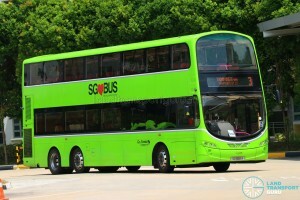 Among the 50 buses to be bought from SBS Transit, 12 are single-deck buses, while 38 are double-deck buses. In total, LTA will be buying 112 Mercedes-Benz O530 Citaro single-deck buses and 284 Volvo B9TL buses for the BCM, worth around S$187 million. On 11 August 2016, the Land Transport Authority (LTA) announced finalised plans leading up to the full transition of the bus industry to the the Bus Contracting Model (BCM). 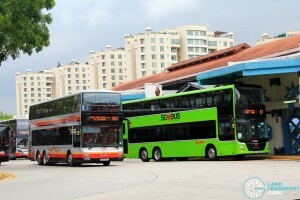 SBS Transit and SMRT Buses, the two dominant bus operators in Singapore, agreed to continue operating their existing bus routes for the next 2 to 10 years under a new BCM framework, which was implemented from 1st September 2016. 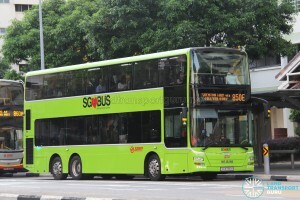 As part of the transition, all existing bus services in Singapore (previously operated by long-standing duopoly between SBS Transit and SMRT Buses) were divided up into 14 route packages, operating under a negotiated contract with the incumbent operator until the Bus Package is tendered out competitively. 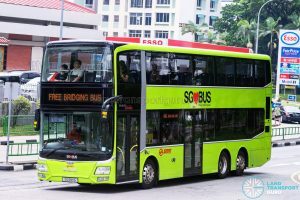 The first three tendered contracts were for the Bulim, Loyang and Seletar Bus Packages which were announced between May 2014 and June 2016. These packages were awarded to Tower Transit Singapore, Go Ahead Singapore & SBS Transit respectively, with the operators operating the Bus Package under the tendered conditions from May 2016, September 2016 & March 2018 respectively. The remaining 11 route packages comprising existing routes operated by SBS Transit & SMRT Buses (consisting of ~80% of buses) will continue to be operated by the incumbent operators for a period of 2 to 10 years, after which the route packages will be up for open tender. SBS Transit operated 8 packages consisting of 196 bus routes from 01 Sep 2016 for a sum of $5,322 million dollars. SMRT Buses operated 3 packages consisting of 77 bus routes from 01 Sep 2016 for a sum of $1,865 million dollars. These contract sums were reached through negotiations between LTA and SBS Transit / SMRT Buses. 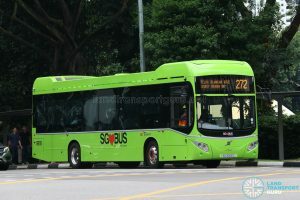 Rather than the mass purchasing of existing buses, LTA had opted to lease all operator-owned buses from SBST/SMRT until the end of their statutory lifespan (17 years with possible 2 years extension) for a fee equal to buying over the bus at net book value as of 1st September 2016 paid across the lifespan of the bus. At the same time, extra Government-owned buses will be leased to SBST/SMRT to meet service requirements as set by the LTA, and will be reallocated to their new operators as more route packages are handed over. Altogether, close to S$7.2 billion will be given to SBS Transit and SMRT Buses on this phase of the BCM transition, and in return, LTA would collect all fare revenue gathered by these bus operators. Similarly, the operators would have to deliver service standards set by the LTA. The 11 packages are designed to not involve any change of operators for bus services currently operated by SBS Transit & SMRT Buses. As such, all employees of SBS Transit and SMRT Buses would not be affected by the full implementation of the BCM from 1st September 2016. With the completion of the Bus Service Enhancement Programme (BSEP) in Late 2017, new bus services continue to be launched under the Bus Contracting Model. Operators of these new services receive additional service fee based on the additional mileage of the new bus services. 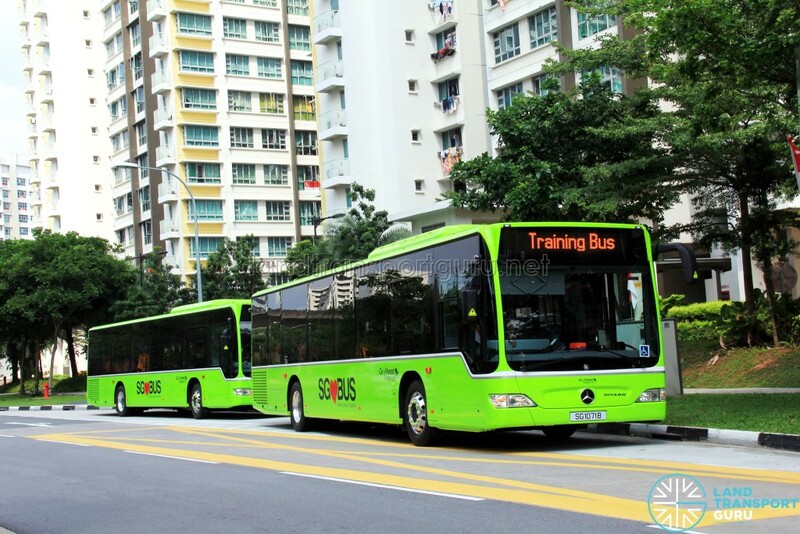 In 2015, LTA purchased 176 additional Volvo B9TL buses built to SBS Transit specifications. 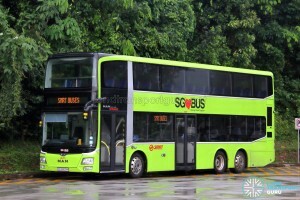 These buses were registered SG5000E – SG5175J, forming the first SG-prefix registered buses as part of the Bus Contracting Model. 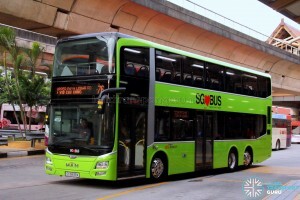 In addition, LTA also purchased 60 MAN A95 buses (SG5740C – SG5799J) for the Bus Contracting Model in 2015. 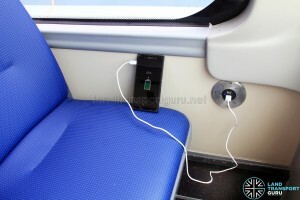 The last 10 units of these buses are equipped with USB Charging Ports, making them the first batch of public buses to feature USB Charging Ports. Charging Ports for the Upper Deck front row seats. In September 2016, LTA purchased another batch of 122 MAN A95 buses (SG5800M – SG5920A & SG2017C). 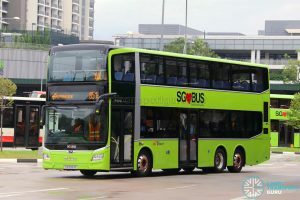 In late 2016, LTA also purchased another batch of 15 Alexander Dennis Enviro500 buses (SG5700T – SG5714D). In 2017, LTA purchased 250 units of Euro 6 MAN A95 & MAN A22 buses under a negotiated Contract PT337 – Procurement of 250 MAN Buses. 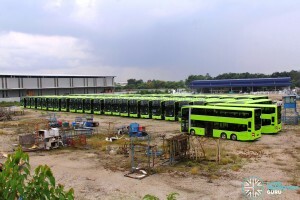 On top of this, an additional 150 units of Euro 6 MAN A95 buses were also purchased. In October 2017, LTA awarded Contract PT313 – Procurement of Diesel Hybrid Buses (DHB) to Volvo East Asia (Pte) Ltd for the purchase of 50 Volvo 7900 Hybrid (Volvo B5L Hybrid) Buses. In July 2018, LTA awarded Contract PT322 – Procurement of Euro 6 Double Deck Diesel Buses to ST Engineering Land Systems Ltd. for the purchase of 111 MAN A95 buses. 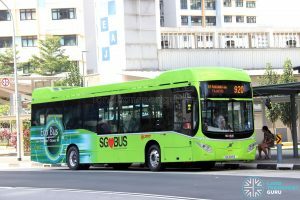 In December 2017, LTA put up a tender for Contract PT323 – Procurement of Electric Buses (E-Buses), with an order for 60 Electric Buses. 3 Tenderers were awarded. In May 2018, LTA put up a tender for Contract PT342 – Procurement of 3-Door Euro 6 Double Deck Diesel Buses, with an order for 100 Double Decker buses. The tender is currently under evaluation. Hi…this morning around 0810hrs boarded bus 15 at busstop parkway parade. This bus air con is down. Your driver don’t have the courtesy to alert all customers before boarding. At least let us know before boarding n decision is on us to board. After tapping my ezlink n check with your bus captain. .replied fm bus captain. . we go back to terminal n check. Is a long journey fm parkway parade to pasir ris. Ordi down before reaching parkway parade. Inside bus is so very hot. Bus captain should hv stop the bus journey n alert buskeeper or alert customer before boarding. …. we paying for a comfort journey not an oven journey. Very disappointed wz bus captain reply. Im starting to hate GCM,so SMRT and SBST is gonna end?? 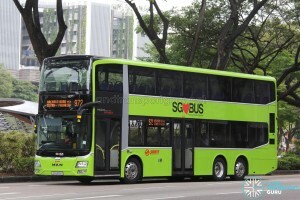 and 858 won’t be using bendy buses(depends on the new operator) in futurw huh!?? what is LTA thinking SMRT & SBST are bad operators?? CCK/BPJ should be 32 service not 23..And i feel svc like 172 & 180 should be given to Tower Transit plus 174 & 174e in exchange for svc 96,282,284 & 285. Punggol svc like 82,83,84,85,119,382 & 385 should be given back to SBST.In return can exchange svc 19,39,58,59,81,88 & 109 for Go-Ahead. It should be called the BUS HOGGING CONTRACTING MODEL. It does not reduce travelling time , instead it increases the travelling time . 20kmph top speed + stopping at bus stop and wait for 5 mins to go before leaving . All this is a bloody fail for me . So the BUS HOGGING CONTRACTING MODEL is a big fail . Stop annoying us OK. It’s not Tower Transit’s fault. We are just allergic, get it? I am a little confused about how the GCM works. 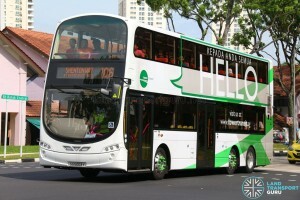 It was stated in a later article that the advertising revenues can be kept by the bus operators. However, if the buses are going to all be of the same colour and design (green), how would the advertising revenues come in? 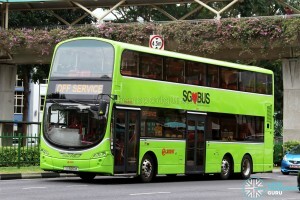 There is another conflicting information on how Go Ahead’s London buses are brought over to Singapore. 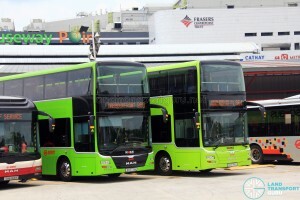 Does it mean that these buses do not have to have the common livery? Would really appreciate your kind reply! GCM Operators (Tower Transit & Go Ahead) are allowed to generate additional revenue from advertisements on the bus fleet provided by LTA. These advertisements are allowed by LTA to be pasted over the standard lush green base livery. 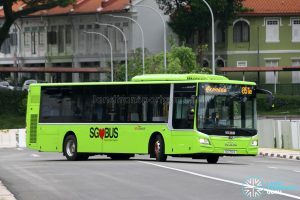 Similarly, government-related advertisements, such as MyTransport SG or Gov.sg, will also be placed over the lush green livery of the operator’s buses. There is a common misconception among the general public that London buses will be brought in since Go Ahead London won the Loyang Package. 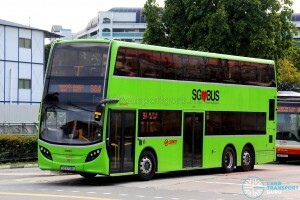 However, as stated in the GCM, Go Ahead Singapore will be using existing BSEP Buses (Ie: Mercedes-Benz Citaro, Volvo B9TL, Alexander Dennis Enviro500 & MAN A22). 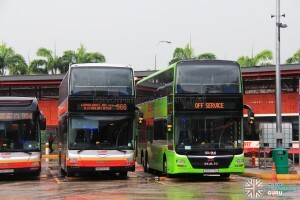 These buses are owned by LTA and will be leased to the operator for them to operate. 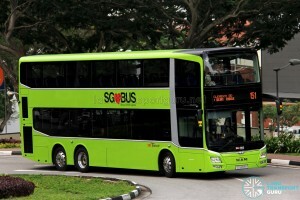 The buses will be in the lush green base livery with Go Ahead Singapore’s logo on them.